It's amazing what can happen in the short span of two years. 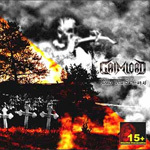 Grimlord's 2007 full length debut Blood Runneth Over was as a homegrown, self-financed, and only a bit better than average disc of traditional heavy and thrash metal. It was enjoyable and promising if you could overcome La Picard's average vocals and the horrible production. With this year's Dolce Vita Sath-anas, Grimlord has advanced light years in both music and production. Dolce Vita Sath-anas makes a clear turn towards more progressive metal. Even though the first three songs evidence some classic thrash elements and some modern metal nuances, they still have elements and movements that are diverse. From Shade of Wrath Angels to the end, Grimlord almost entirely abandons vocals for a strong lesson in instrumental prog. This progressive metal grounded deeply in melodic heavy metal, but turns on exceptional bass work, fluid yet unobtrusive keyboard additions, and fine guitar solos. And I have to say it: I didn't miss La Picard's lead vocals in the least. Ground Zero, Dissolution of Eternity, Ancient Land of Ys are simply brilliant and enthralling pieces from Grimlord. Dolce Vita Sath-anas is major achievement for Grimlord, an album by which future projects will be measured. Very recommended. Dolce Vita Sath-anas shows Grimlord advancing and transforming from an average band recycling old thrash and heavy metal conventions to a mature melodic progressive metal band with better ideas and greater innovation. Great stuff!